Thank you for all of your wonderful donations. In our office we are constantly thinking about how we can improve the lives of others. There are many things to be said about Chiropractic care but that is not the meaning of this post! This year, our Fremont office decided to partner with the Marine Corps Reserves’ Toys for Tots organization to help make this season just a little more merry for some less fortunate kids. 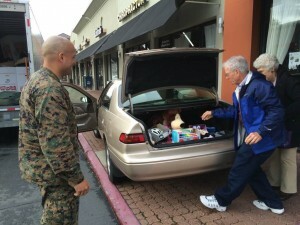 Staff Sergeant Morales was getting ready to load up when Jack and Carolyn N. drove up with a trunk full of toys! In just a matter of weeks the Fremont staff and our patients donated well over 150 toys! Our patients are constantly amazing me by their generosity and unwavering love. Everyone seemed to be in a giving mood and more than happy to provide a basketball, a stuffed animal, a puzzle etc. for children of all ages. Since I have started working with Discover Chiropractic (a year now!) our patients have always displayed their generosity and willingness to help others. I have been very lucky to get to know each and every one of them. This donation drive only highlighted what I already knew… our patients are AMAZING! This blog is to give you all a BIG THANK YOU! 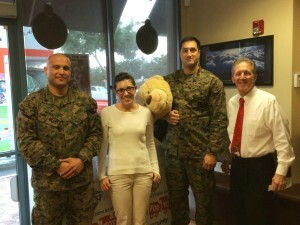 The Marine Corps Reserve, Jenna (me), and Dr. Fisher couldn’t resist a picture!